After joining ‘Tuesdays With Dorie’ back in April of 2008, I was lucky enough to hostess a recipe twice before we completed the book… once, with Parisian Apple Tartlets and again, with Chocolate Spice Quickies. Granted, it felt like an eternity waiting for my turn to come around, but it finally happened. It’s now four years later and I’m absolutely honored to be one of the first to hostess from Baking With Julia. I’ve made Rugelach once before (with TWD, in fact! ), so I was familiar with the method and the outcome. However, I was thrown for a loop when I realized that the dough isn’t cut into wedges before filling, but into rectangles instead. It’s like slice and bake, with a yummy filling! It’s time-consuming work (especially waiting for the cookies to chill!! ), but incredibly worth it in the end. Margaret of The Urban Hiker is my co-hostess this week. She’ll have the recipe listed on her blog, as well, and if you’re interested to see how everyone else’s Rugelach turned out, click over to the ‘Leave-Your-Link’ post! No matter the shape of your Rugelach, whether crescent-like or jelly-rolled (or studded with chocolate chips, like mine! ), enjoy! Beat the butter, cream cheese and salt together until smooth in a mixer fitted with the paddle attachment. Mixing on medium-low, gradually add the sugar and beat until light. Reduce the speed to low and add the flour, mixing only until the dough comes together. Turn the dough out onto a counter and work it gently into a ball. Divide the dough in half and press each half into a rough rectangle. Wrap each half in plastic and refrigerate until firm, about 2 hours. The dough can be wrapped well and stored in the refrigerator for up to 2 days. It can also be frozen for a month; thaw, still wrapped, in the refrigerator. Whisk together 1/2 cup of granulated sugar, the brown sugar and 1 tablespoon of cinnamon in a small bowl and set aside. Put the remaining 1-1/2 cups granulated sugar, 2-1/2 tablespoons cinnamon and 1-1/2 cups of the assorted nuts into the work bowl of a food processor and pulse until the nuts are finely chopped. Turn into a bowl and reserve for topping the rugelach. Line a baking sheet with waxed paper. Working with one piece of the chilled dough at a time, place it on a lightly-floured work surface or pastry cloth and let it soften for a few minutes. Flour your rolling pin and roll the dough into a rectangle 14×10-inches and 1/4-inch thick. Don’t be tempted to roll the dough thinner – you need a sturdy wrapper for all the chunky filling ingredients. Trim the edges of the dough and, using a long knife or a pizza cutter, cut the dough in half lengthwise, to make two 14×5-inch rectangles; leave the halves in place. Spread each half generously with one quarter of the prune or apricot lekvar. Sprinkle with one quarter of the brown sugar-cinnamon mixture, pressing lightly with your fingers to spread it evenly if necessary, then finish by strewing 1/2 cup of the remaining chopped nuts and 1/2 cup of the dried fruit over each dough half. Starting with a long edge of dough, roll up each rectangle jelly-roll fashion, tucking in any fruit or nuts that fall out along the way. Transfer the rolls to the paper-lined baking sheet and roll and fill the remaining dough. Cover the rolls with plastic wrap and refrigerate until firm, at least 4 hours or preferably overnight. Position the oven racks so that they divide the oven into thirds and preheat the oven to 375 degrees F. Line two baking sheets with parchment paper. If possible, double up the baking sheets, a precaution against burning the sugar on the bottom of the rugelach. Push the egg wash through a sieve and reserve. Although you can bake two rolls’ worth at a time, you will probably have to bake these in batches, so work with one roll of dough at a time. Brush the roll all over with the egg wash. Using a serrated knife and a sawing motion, slice the roll into pieces that are 1 to 1-1/2 inches wide. Toss each slice in the cinnamon-sugar-nut mixture to coat generously (you may need to press the topping onto the rugelach with your fingers). Transfer the rugelach to the prepared baking sheets, cut sides down, leaving an inch between each pastry. Bake for 25-30 minutes, rotating the pans top to bottom and front to back halfway through the baking period. The rugelach are done when the tops are golden and the bottoms are caramelized. Cool the pastries on the pans for 5 to 10 minutes, then release them from the parchment by running a thin spatula under them. Cool to room temperature on a rack. Repeat with the remaining rolls of dough. The rugelach will keep for a week in airtight containers; sealed in plastic bags, they can be frozen for up to a month. Thaw, still wrapped, at room temperature. Wow, Jessica – these look great – much more traditional than the ones in the book. 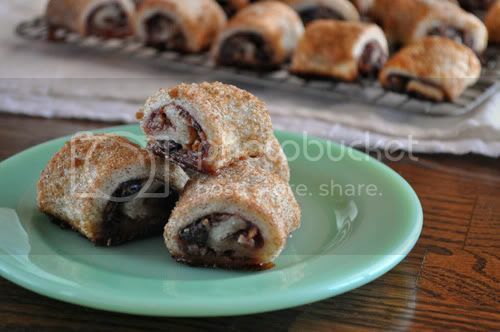 I love Rugelach with chocolate and cinnamon. okay, this looks ridiculously good! I really should have done the chocolate, maybe next time. Beautiful! Your rugelach looks wonderful! Congratulations on hosting again with the new group. Your rugelach are beautiful!!! Mine were a bit of a disaster but still tasty. 🙂 I live in Arlington but attended the Culinary School of Fort Worth so we are sort of neighbors. I’ll look forward to seeing more of your posts. Thanks for hosting. yours look much prettier than mine….I baked them spiral ‘up’ but now that I see yours, I know I did mine ‘wrong.’ no matter. still tasty, and I didn’t get any complaints!!! Yours look absolutely beautiful! Next time I make these I’m definitely going to try adding chocolate, chocolate makes everything better! Gosh, yours are so pretty! None of mine came out quite that perfect-looking. Thanks for hosting! Thanks for hosting this week! I put chocolate chips in mine, too. I think I like Dorie’s version of this from BFMYHTY better. Yours look delicious! Your rugelach are lovely. I, too, was expecting the cresents after making the TWD ones. These were a little harder, but tasty. Your rugelach look beautiful! Much prettier than mine! I did the chocolate chip filling in one roll – tasty! Thanks for hosting! I am very excited about this. I have had this book for a long time and bake out of it form time to time, but was just thinking of baking through it myself…wonderful! Looks inspiring! I was thinking of not doing this recipe (obviously not doing on time!) but I think I will after seeing your beautiful pastries. Thanks for hosting. The last time I made Rugelach was with TWD also. Thanks for hosting. Your cookies look great! Thanks for choosing a good challenge! Great pick Jessica. A recipe I had never made. Yours look beautiful–very different from mine! Maybe you need to teach a class! wow, your rugelach looks absolutely amazing! I am definitely using chocolate and cinnamon next time, although I did like the fruit and nut version. Thanks for hosting. Adding chocolate chips is a great idea. They look perfect, Jessica! They look so lovely! I liked my filling, but chocolate would be soooo good! Your rugelach look gorgeous. Mine did not look so beautiful, but they were addictively delicious. Thanks for hosting. Yours are just gorgeous! Loved these! Beautiful! My dough is chilling. I hope mine look half as good as yours. Thank you for hosting. Loving your photos!! Thanks for hosting and lovely picture! Beautiful pictures thanks for hosting! These are beautiful! And I love the photographs. The green plate is perfect. 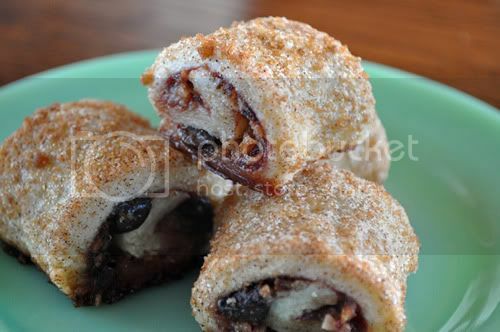 Beautiful rugelach…they look perfect. Thanks for hosting! thanks for hosting this week. these look perfec(as per usual)t! Hi, thank you for hosting. Your rugelach are fab! and your picture so lovely! So happy to have joined the group: so much fun! These sound mouthwateringly delicious! 🙂 Great photos! 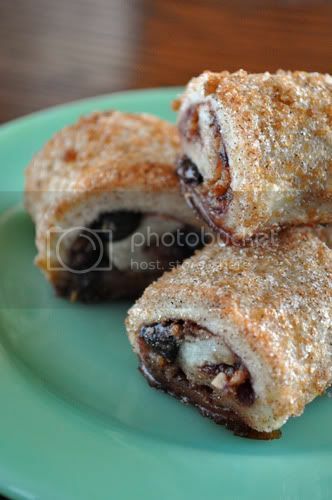 Your rugelach and photos are gorgeous as is your whole blog! Beautiful! Great job hosting! Thanks! 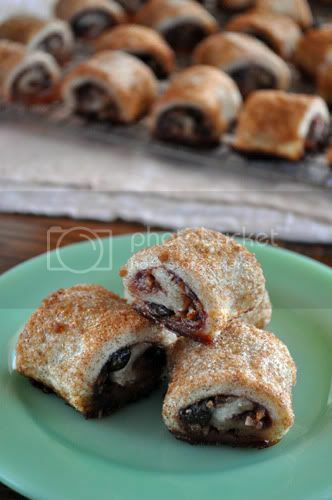 Fun blog to read- appreciations for hosting; your rugelach look scrumptious! Thanks for hosting! Your pictures are great. Yours turned out so neatly. This was a recipe wirh a delicious outcome, even though time consuming. So luscious and so pretty! TWD: Rugelach « Baking "Together"
Previous post: ‘Champorado’ for Krystal’s Virtual Fiesta Baby Shower!